The plural of the word “emoji” may still be up for debate, but the popularity of these symbols no longer is. Google just spent eighteen months redesigning their emoji. Apple made emoji of their leadership team for World Emoji Day 2018 and also just released 70 new emoji, including new hair designs (you are officially recognized red heads). How does this relate to websites, you ask? Let’s talk emoji domains. They’re here. And they’re gaining traction. Maybe. Probably. Only time will tell, but you need to be in the loop all the same. First things first, what are emoji? If you don’t know the word, you know them by sight. These small digital images and icons are ubiquitous in online conversations—whether they should be or not. A  can express happiness. A ❤️ can express love. A 樂 can capture the mood of the latest news that makes you stop and think, or there’s always the , also known as “Face With Tears of Joy,” which Apple has noted is the most popular emoji on iphones in the U.S. by far. 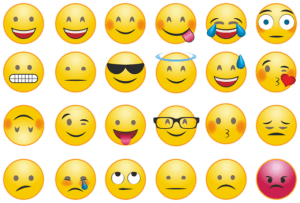 Some consider them childish, and others call them “the first language born of the digital world.” The emoji of today were derived from the simple 🙂 and 8-D style expressions of early internet message boards. They first appeared on Japanese phones in the late 1990s, and their popularity has only spread from there. The first three emoji domains (☮️.com, ♨️.com, ♨️.net) were registered on April 19, 2001, but at this point, these were largely theoretical in application. The first emoji domain in action was .la in 2011—no, we didn’t make that up—and also in 2011, Apple added an official emoji keyboard. “” was the Oxford English Dictionary’s “word” of the year for 2015, and “The Emoji Movie” was released in theaters in 2017. They are everywhere, and it seems like they will continue to be. Not everyone speaks the same language. Not everyone can read or understand the jargon of a given industry, but everyone understands images. Are people buying and using emoji domains? Absolutely. In fact, since the 2015 hackathon when a GoDaddy developer developed i❤️domains.ws, the first emoji search engine, over 25,000 emoji domains have been registered. Budweiser owns ❤️.ws, and Coca-Cola ran a powerful ad campaign with .ws. No single emoji domains appear to still be available, but with new emoji continually being released and old domains sometimes expiring, who knows what you can find. Why are emoji domains using .ws and .fm instead of .com and .org? While many are swooning (or should we say ) over emoji domains, ICANN, the Internet Corporation for Assigned Names and Numbers that governs top level domains (TLDs), is not. This isn’t to say that they never will support emoji domains for .com, .org, and other TLDs, but as of this writing, there is no sign of this changing. What makes things interesting is that country code domains (ccTLDs) are ultimately decided by individual countries. Most countries are following ICANN’s recommendation, but a few are not. These include Western Samoa (.ws), which is considered the most established in this area, but also others including Anguilla (.ai), Laos (.la), and recently the Federated States of Micronesia (.fm). A select number of emoji domains slipped through the cracks when they were purchased before ICANN made this ruling in 2010 (well played, owner of ☁️.com), but if you’re looking to own your own, look into the available country codes for now. Do they work in all web browsers? Yes and no. All browsers will bring someone to the correct website, but some will not display the emoji domains in the address bar. Chrome, for example, translates an emoji domain into punycode, which is admittedly significantly less fun to look at. Apple’s Safari, on the other hand, does recognize and retain emoji domains in the address bar. Of course, Apple’s been a leader when it comes to emoji from the start. Are emoji domains really going to be a thing? If Google and Apple are any indicator of the future of emojis, signs point to yes. Both companies, among many others, are spending a lot of time thinking about their emoji. Whether you’re looking for a web guy (️.ws) or hoping to be inspired by opening a book (.ws), there’s an emoji domain out there that might meet your needs. And if there isn’t, maybe it’s time to purchase one of your own. A fad or the future, we don’t yet know. But with the continuing conversation about the future of URLs in general, this is one possibility to keep an eye on. Questions about what domain might make sense for your business? From keyword strategy to emojis, Midlothian Web Solutions loves conversations like this. Contact us today, and let’s talk about your first steps to digital success.